Saturday June 2 is National Trails Day. One way to celebrate is to join a ride from the Burke VRE station to the ribbon-cutting ceremony for the Pohick Stream Valley Trail. The group will meet at 9:30 a.m. and leave at 9:40. For more information, call the Park Authority Public Information Office at 703-324-8662. 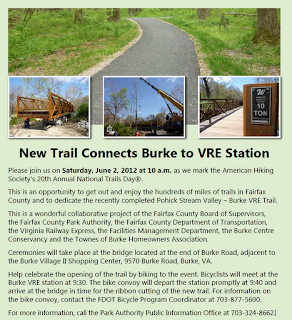 According to the Park Authority, the trail connects to "the Burke VRE station with Burke Lake Road and the Burke Village Shopping Center. The project included construction of two sections of asphalt trail and one stream crossing. One section connects the VRE station with a newly constructed trail and existing Park Authority and Burke Conservancy trails in Pohick Stream Valley Park. "Another section connects the park trail with Burke Lake Road and Burke Road to the east via a new bridge. The completed trail provides more than two miles of contiguous stream valley trail with several public and private trails connecting the VRE station, the shopping center and several residential communities. It is an example of the success found in partnerships which result in new opportunities for recreation and an alternative route to key public transportation destinations."